Scandyna adds bass module to create an even odder 'pod | What Hi-Fi? The new speaker, distributed in the UK by Armour, combines the existing Minipod speaker, with its 25mm tweeter and 12.5cm Kevlar mid/bass driver, with the Megapod bass unit, a subwoofer with a long-throw 25cm bass unit. The whole thing is linked together with a curved aluminium arm, which conceals the cables linking the two, and sits on a trio of Sputnik spikes. 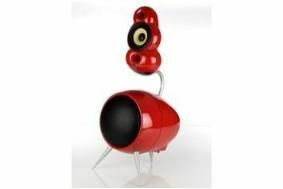 The Megapod speaker is available in white, black, silver, blue, yellow or red, at £2396 a pair. Alternatively, owners of the £649-a-pair Minipods can add the Megapod bass kit for £1850 a pair.